Ran across this image on the web site of Swedish newspaper Aftonbladet, and since it makes me cringe, it must be worth sharing. 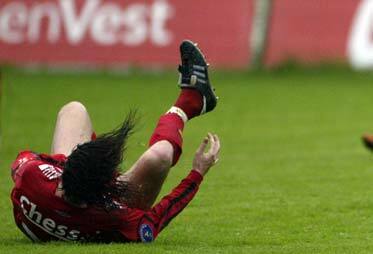 Midfielder Fabijan Cipot, right after being tackled. I hope he’ll make a full recovery. And yes, soccer is statistically speaking one of the most dangerous sports to play. Fabijan Cipot, 28, hoped to play his way to a contract with Norwegian [soccer] club Brann. Instead, his career may be over after a dirty tackle during a friendship game against Birmingham. "It’s the worst thing I’ve seen in my entire career," says Brann midfielder Paul Scharner to [Norwegian newspaper] _Verldens Gang_.